Their professional public service careers had intersected many times in Sydney and the Blue Mountains before they studied together to gain their masters degrees in Social Ecology and Health Science. Then Judi had an accident and Sandra succumbed to ill-health and both had to search for new career options. Because of asthma, Sandra was medically retired from her post as Administrator of the Blue Mountains Area Community Health Service. Judi badly injured her back when she fell off a deck at her home, spent 12 months off work, found it was then impossible to drive and as a result could not resume her career in community business management and early childhood services (including rural and remote and isolated children’s services) which required her to regularly travel from one end of New South Wales to the other. 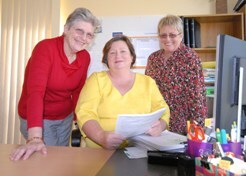 With her area health service work involving a lot of property issues, Sandra, a graduate in health administration, went back to university, qualified as a licensed conveyancer, gained the required two years’ practical experience then opened a home business at Bullaburra specialising in property conveyancing. Judi became her business partner in Longmore and Associates. Their property conveyancing business became very successful in a short time because of the high profile both had established in the Blue Mountains. An on-the-spur-of-the-moment decision during one of their Nowra visits made them owners of land close by the Shoalhaven River. At that time they had no intention of moving. Their 10-year conveyancing business plan was based on them remaining in the Blue Mountains for that period and only then looking at their retirement options. However, other developments forced Judi and Sandra to reappraise their options. They ran out of space for themselves and their Bullaburra home-based conveyancing business. They were “pushing the walls out” and had to move to larger premises. In the meantime, they’d developed a dislike for Blue Mountains life – winter conditions were the enemy. With the Shoalhaven offering relief from the winter cold and also for Sandra’s asthma and with their Nowra riverside block sitting idle, “we asked ourselves ‘why wait for retirement’?” Sandra explained. They built a spacious new home complete with dedicated office space and guests accommodation, sold up at Bullaburra and moved permanently to the Shoalhaven at the end of 2001. Longmore and Associates Licensed Conveyancers drew strong support and grew rapidly in the Shoalhaven. Sandra and Judi had completed just seven years of their new 10-year Shoalhaven business plan when they received an offer from another licensed conveyancer, Judy Bliss, for the Longmore and Associates business. The offer came with the proviso that the house with its office facilities be part of the deal. They sold and the changeover has just been completed, coinciding with the end of the financial year. Sandra and Judi have acquired another house not too far from where they had their business and are currently (July 2008) on a two-month caravanning holiday. On their return they will establish a micro business support program through which clients will benefit not just from their academic training and professional experience and their combined skills in dealing with top managements and bureaucracies but also from their network of contacts across the State, the Illawarra and the Shoalhaven. During their time in business they saw the training available in Nowra through government sponsored local business support programs and “plugged into it” and that included extending their marketing, IT and computing skills. Both upgraded their credentials while in the Shoalhaven (Judy adding to her masters degree in social ecology and Sandra to her masters degree in health science) through what they describe as outstanding TAFE courses in Training and Assessment. FOOTNOTE: These are two very engaging personalities - one a nurse who has seen life in full spectrum during a career in health services; the other whose down-to-earth approach has allowed her to deal with even the most delicate of children’s and family issues in regional cities and towns and in rural and remote and isolated areas. They share the humour they found in many of their joint ventures during their area health/children’s support services days. One of their joint projects (Sandra provided funding from her budget, Judi’s network delivered it) was designed to tackle ear issues in kids. The solution to this major and wide-spread health problem was to simply get kids to regularly blow their noses and thus clear their nasal passages. When Judi and Sandra reported the amazing results of their ear issues initiative to their bosses within the bureaucracy, their government-funded project was described in elaborate yet elegant medical terminology. However, in the field, when they relayed their ear issues message to their target audiences they used language universally understood among the kids by calling it the “stop the snot project”.